How much does it cost to travel to Bressanone? How much money will you need in Bressanone? €31 ($35) is the average daily price for traveling in Bressanone. The average price of food for one day is €6.63 ($7.51). The average price of a hotel for a couple is €44 ($50). Additional pricing is in the table below. These average travel prices have been collected from other travelers to help you plan your own travel budget. How much money do I need for Bressanone? Nestled within the rolling hills of the Italian countryside, this time capsule of medieval Europe is teeming with extensive culture and history. Located in the north-east of the Trentino-Alto Adige region to the south-east of Vipiteno, Bressanone is the third largest city and oldest town in the province. Moreover, Bressanone also works as the cultural and artistic capital of the region. The first mention of Bressanone as a formal township was in 901 AD when Louis III the Child, then king of Germany, named the territory Prihsna whose name later became Bressanone. Though located in Italy, due to its strong German roots, about 72% of the population speak German as their first language. Because of its vast history, Bressanone has a wide array of landmarks and sights that are just waiting to be explored, such as major ski resort the Plose, the Hofburg, the "Pharmacy Museum," and the Cathedral of Bressanone. Built around 980 AD, the Baroque Duomo of Bressanone, or Cathedral of Bressanone, is one of the main landmarks of the town. The Cathedral underwent a massive restoration, where three aisles and two towers were properly equipped. Said reconstruction occurred between 1745 and 1754. However, what makes the Cathedral such an exquisite piece of art lies within the walls of the great baroque-style church. Frescoes and paintings by Paul Troger and his pupils can be seen throughout the glorious piece of architecture with a major altar embellished with marble constructed by Theodor Benedetti present. Besides the major altar, there are many other important altars present, such as the altar of San Cassiano by Franz Faber from Telfs, where the relics of the Saints Bishops Ingenuino of Sabiona and Albuino of Bressanone are preserved, the altar of the Rosary by Francesco Oradini da Trento, where you can witness the statues of St. Lawrence and St. Stephen, and the altar of Sant'Anna, also made by Franz Faber. The Cathedral also houses the Late Lady Madonna created by Hans Leinberger. With such a great collection of religious art and architecture, the Cathedral works both as a museum for Christian artwork and house of worship. Guided tours for the Cathedral are provided from Monday through Saturday at 10:30 AM to 3 PM. Located in the Traube Hotel, Restaurant Traubenwirt is a honeycomb for fine dining and once-in-a-lifetime experiences. Specializing in South Tyrolean and Meditteranean dishes, Restaurant Traubenwirt ensures that its patrons are served with only the freshest ingredients and friendliest service. Besides its extensive list of appetizers, meals, and desserts, Restaurant Traubenwirt also provides a specialty wine list to compliment your palette. Moreover, unlike most restaurants, Restaurant Traubenwirt allows you versatility in your dining atmosphere, with patrons able to either dine in the Traubenkeller or in the historic inner courtyard. All guests staying at the Traube Hotel receive a 10% discount on their meals, though a three-course meal is offered as half-board at only 29 euros. Some of the star meals at Restaurant Traubenwirt include grandma's beef stew with speck dumplings, roasted potatoes with cooked slices of roast beef, onion rings and marjoram served with salad of coleslaw and Speck, butter-breaded veal cutlet with roasted potatoes and jam of cranberries, and marinated rib-eye steak of the American Angus beef served with three sauces, potatoes en papillote with sour cream sauce and grilled courgette. Throughout South Tyrol, all towns are intimately connected by train or bus. If you are driving a rental car, however, the roads are some of the most well-kept in Italy and road signs are clear and easy to navigate around. If you are seeking to travel inside South Tyrol, it is highly recommended that you buy a Value Card which can be sold at 5, 10, or 25 euros. This Value Card gives you access to the extensive bus and train network present not only in Bressanone but throughout South Tyrol. However, there are a plethora of rental car companies found throughout Bressanone for those who are adhering to a more independent, remote tour. Just as the roads are well-kept, so are the laws throughout South Tyrol, so be sure to follow the rules of the road conscientiously as police are far less tolerant as compared to other regions. 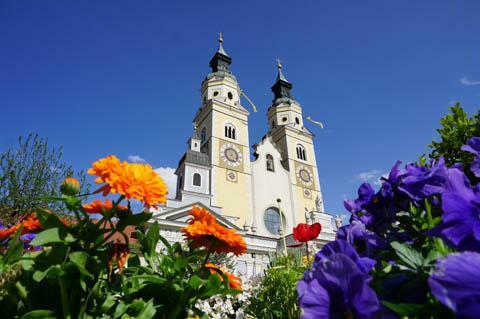 Be that as it may, one of the most highly recommended methods of travel throughout Bressanone is biking or hiking. Not only does this provide a healthy amount of exercise, but it allows you to explore the expanse of the beautiful landscape of the town in-depth. An interesting way to check out some unique art is to see the old mural paintings in Bressanone. There are some fascinating paintings in the arcades next to the cathedral. Alternatively, you can just wander around town. Many of the houses have interesting murals that come from as early as the 14th century. They are mostly religious in nature, but you can see some very fascinating takes on life in that time period. There is an early Renaissance palace directly across the domplatz from the dom. The rooms are decorated with fascinating works that are 300 to 600 years old. Even more interesting, if you happen to be in the area in the winter season you can see a collection of over 100 carved nativity scenes, many of which date back to the Gothic era. You can go to the garden which has a free admission. It's a great place to wander and relax for a little while.